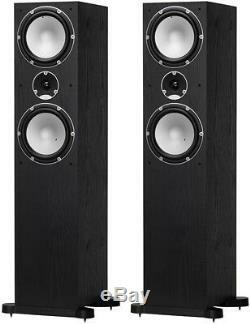 Tannoy Mercury 7.4 Speakers Pair - Black Oak. 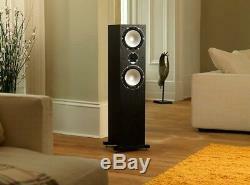 The latest version of this speaker delivers more power and musical enjoyment than ever before. These speakers are suitable for larger rooms or where high sound levels are required, Mercury 7.4s 44-litre twin-ported cabinet, dual 178mm (7") mid/bass drivers and refined 28mm (1.1") soft dome tweeter pack a mighty punch. To make this latest version of the Mercury even better than the award-winning Mercury Vi series needed completely new driver designs. The new Mercury 7 mid/bass drivers are fitted with a significantly larger than previous models, enabling them to deliver deeper bass with a greater punch than any competitor design. The Mercury 7 cone uses an updated version of Tannoys proprietary multi-fibre cone material with a smoothly sculpted profile for better dispersion and more accurate midrange reproduction. The 7.4's are fitted with a new 28 mm (1.10) Mercury 7 tweeter which is constructed from a soft woven polyester dome that is coated to Tannoys exacting specification with a micro layer of nitro-urethane. This lamination process damps the dome and pushes its break-up frequencies far beyond the audible range. The treble is smooth and detailed with an extended frequency response to over 32 kHz. Along with the high-current crossover and audiophile grade components, Mercury 7.4 can be driven hard and deliver realistic dynamics, yet remains subtle and refined at everyday listening levels. Its wideband frequency response from 32Hz up to over 32kHz ensures peak performance with a standard as well as High-Resolution Audio formats to make the Mercury 7 series flagship model future-proof. We are an authorised Tannoy dealership, so you can be assured of receiving new and genuine products. Freq response (-6dB): 32Hz - 32kHz. Recmnd Amp Power: 20 - 150W RMS. HF: 28mm Nitro-urethane damped layer. Woven polyester: neodymium magnet system. LF: 7 Multifibre coated pulp paper cone x 2. Crossover Frequency: 2.4 kHz. Crossover Type: Passive low loss. 3rd order: High pass, bi-wired. Enclosure: Twin rear ported reflex. Volume: 44.0 l 1.55 cu. Dimensions (HWD): 955 x 314.3 x 308mm. Net weight: 15.0 kg (33.1 lbs). We also have these speakers available in different. Orders placed on a Friday morning will be delivered on the Monday. We aim to provide a fantastic shopping experience for all our shoppers. If you are pleased with the service you receive then please leave feedback accordingly, it really helps us as a small business. We understand that mistakes can happen, and we are more than happy to resolve any issues that may arise. View these items & similar. Audio Affair 23 Gibb Street Custard Factory Birmingham B9 4AA. Sign up for exclusive offers. The item "Tannoy Mercury 7.4 Speakers Pair Floorstanding Home Stereo Black Tower RRP£499" is in sale since Thursday, August 16, 2018. This item is in the category "Sound & Vision\Home Audio & HiFi Separates\Speakers & Subwoofers". The seller is "hifi-madness" and is located in Birmingham. This item can be shipped to United Kingdom, Antigua and barbuda, Austria, Belgium, Bulgaria, Croatia, Cyprus, Czech republic, Denmark, Estonia, Finland, France, Germany, Greece, Hungary, Ireland, Italy, Latvia, Lithuania, Luxembourg, Malta, Netherlands, Poland, Portugal, Romania, Slovakia, Slovenia, Spain, Sweden, Australia, United States, Canada, Brazil, New Zealand, Israel, Hong Kong, Norway, Indonesia, Malaysia, Mexico, Singapore, Switzerland, Taiwan, Thailand, Belize, Bermuda, Bolivia, Barbados, Brunei darussalam, Cayman islands, Dominica, Ecuador, Egypt, Guernsey, Gibraltar, Guadeloupe, Grenada, French guiana, Iceland, Jersey, Jordan, Cambodia, Saint kitts and nevis, Saint lucia, Liechtenstein, Macao, Monaco, Montserrat, Martinique, Nicaragua, Oman, Peru, Paraguay, Reunion, Turks and caicos islands, Aruba, Saudi arabia, South africa, United arab emirates, Ukraine, Chile.